Victoria Gardens offers a comprehensive collection of amenities including a fantastic outdoor swimming pool. 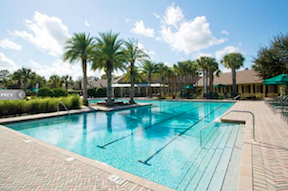 Cresswind at Victoria Gardens in DeLand, Florida is a 55+ golf community with low-maintenance homes, a small-town atmosphere, and an impressive line-up of amenities. As an age-restricted active adult community with a prime Central Florida location, Victoria Gardens is within easy reach of shopping malls and daily conveniences. It is also just 30 minutes from exciting destinations including Daytona Beach and Orlando’s many theme parks. An exciting line-up of activities centers around this community's 20,000 square-foot clubhouse. This spacious facility has a variety of resort-style amenities, such as a state-of-the-art fitness center, hobby and game rooms, and the Gardens Cafe restaurant. A library with computers keeps residents connected to the outside world, while the arts and crafts studio is equipped for pottery, painting, and other creative pursuits. Outdoors, the amenities continue with a heated swimming pool, Har-Tru tennis courts, and bocce courts. The tranquil grounds also include 400 acres of conservation areas with walking and biking trails which wind throughout the community and lead to various parks. In an adjacent community, resident golfers can enjoy a beautiful golf course which was named one of Golf Worlds’ “Top 50 Public Golf Courses in America.” The Victoria Hills Golf Club features a challenging 18-hole, par-72 course which undulates through rolling hills, towering oaks, and Augusta pines. The St. Joe Company began construction of Cresswind at Victoria Gardens in 2001 and built approximately 360 homes before builder Shea Homes took over in 2007. Shea Homes plans to grow the community for a total of 1,070 single-family homes. Offering plenty of variety, the resale homes for sale demonstrate a variety of design styles and home models.